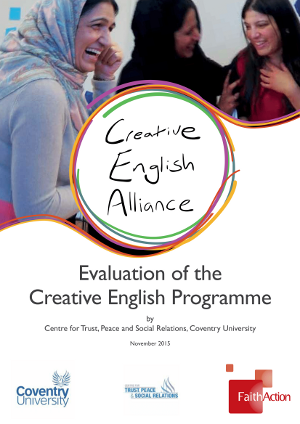 FaithAction are proud to announce the launch of an External Evaluation of the Creative English programme, completed by the Centre for Trust, Peace and Social Relations at Coventry University. 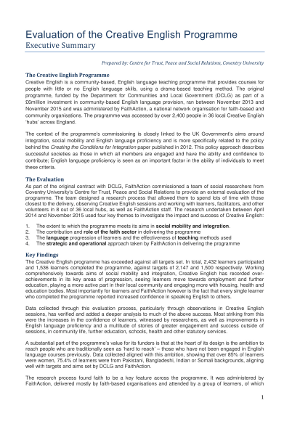 The Creative English programme is making a positive difference to the lives of low- and intermediate-proficiency speakers of English. Learners are made welcome in an accessible, friendly, fun environment and are given the opportunity to mix with other people outside their own immediate family group, as well as being given the chance to improve their English language skills. The research process has found evidence that the programme is providing a valuable stepping stone towards greater engagement with the wider community and, in some cases, further training and increased employability.